This customer reported water intrusion from the roof of their silo. Pictured here, the roof is in two stages. At the bottom of the photo shows the roof as it is prepared for the bonding, rubber coating to seal the roof. Preparation of the roof prior to coating is critical for the longevity and effectiveness of the coating material to fully adhere to the concrete roof slab. In the top of the photo, pictured is the adjoining silo where the roof has not yet been cleaned and prepared to coat. 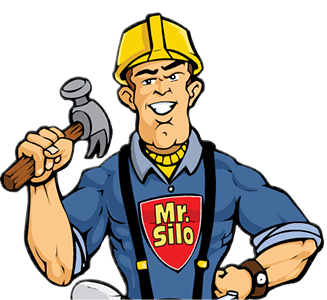 This is typical for the silo roof; material build up and miscellaneous materials left by workers making it very difficult to find the specific spot of the water intrusion into the silo's material storage area. Above is the freshly coated roof slab of the first silo. The rubber coating is bonded to the concrete and is effective in sealing cracks, laps, fasteners and penetrations on roof surfaces and can withstand the expansion / contraction encountered at seams, joints and penetration on roof surfaces. This movement causes conventional rubber sealant brands to fail quickly. A rubber membrane should not be used as a silo roof coating system. Our proprietary bonded roof coating systems are a cost efficient means to stop a structurally sound silo roof from allowing water intrusion into a silo's storage area, preserving the product for operations and system efficiencies.